Here’s an idea that has come up over and over in the long history of Utopian urban planning and architecture: Instead of sprawl taking over the beauty of the natural landscape, why not concentrate all of the living and amenities in one location, leaving the surrounding area untouched? Still, even by that standard, this is pretty extreme. In Fukishima Prefecture, Japan – Way North of Tokyo. Exactly One High Rise and Not Much Else. 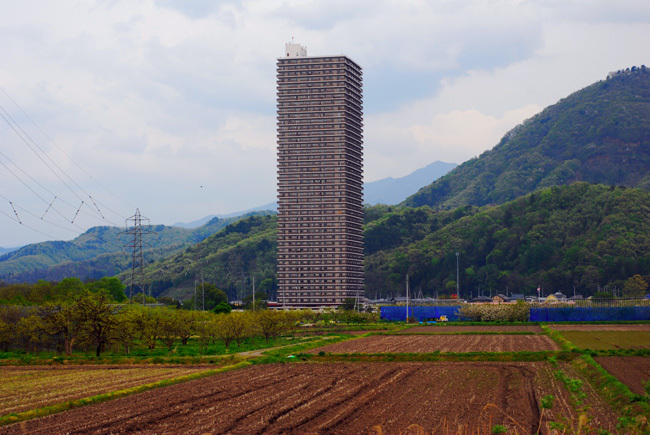 Sitting in the middle of nowhere, Fukushima, surrounded by picturesque mountains and fields, one can only wonder what the occupancy rate is. At 41 floors, it’s taller than most buildings in Tokyo. However if the town does continue to grow (up, not out), it’ll be interesting to see how they manage to fit in things like a baseball stadium and an airport…. ← Forget H1N1, Giant Spiders Are The New Cane Toads.